Steven Tyler, the flamboyant lead singer of Aerosmith, will be seeing a lot of Cryin’ soon. Reports from Aerosmith bassist, Tom Hamilton, state that Tyler, and his magnificent rock voice, will be occupying one of the open seats on the ever-changing panel of American Idol judges. The music has stopped and Tyler has fought his way onto a seat in front of some fantastic soda subliminal messaging. "It was horrible, but, this coke product is amazing"
Let me predict this now. American Idol, watch out. I know Tyler looks and probably is an exceptionally nice guy, but I bet you he is hard on contestants. The man has tremendous talent. He knows music. And, he will not put Abdul fluff on bad performances. Plus, if a rocker stinks, Tyler will certainly let him hear it. I don’t watch Idol…anymore…but, I am sort of interested in seeing how this turns out. Steven Tyler will be giving advice and – if Fox is lucky – better ratings for their struggling show. 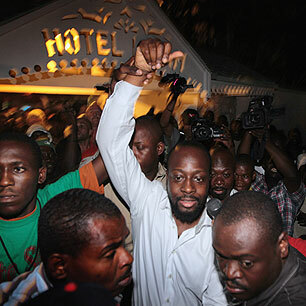 In other giving news…Wyclef Jean is not giving up in his longing to run for president in his native Haiti. After receiving a flat-out no, no, no from the country’s elections board Friday night, Jean has said he will send a lawyer to to a Haitian court today to appeal with the national electoral dispute office. Jean claims to have his paperwork in check and is certainly genuine about his presidential aspirations. Look, I just can’t say no if his status is correct. Obviously, the elections board does not think so, but, if the court overturns their decision and tells Jean he can run for president, then who am I to say that it’s terrible. Heck, I just don’t know. Sean Penn may think that the man is facetious, but, only the citizens of Haiti will have a say. And, if Jean can prove that he is not just riding a disaster and hot air then good for him. His running is the joy of Democracy and if he gets the go ahead to run his race I wish him luck.